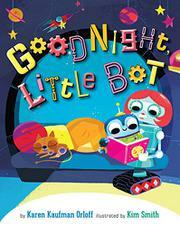 Even little bots need help settling in for the night. A mother robot (signaled with the styling of bolted-on “hair,” red lips, and eyelash-mimicking rivets around her eyes) tells her child it’s time for bed, and then she carries out a multistep bedtime routine to ease the transition to sleep. The steps will sound familiar to readers, though they’re modified from the typical tooth-brushing and glass of water to match the robot theme. For example, Little Bot brushes bolts (inside the thoracic cavity rather than the mouth) and sips some oil instead. The digital art gives the rounded characters oversized eyes, which add to their visual appeal. Rhyming text maintains an even cadence throughout the book, and although they are largely redundant of the written words, Smith’s brightly colored, cartoon-style illustrations pair well with the text, which is at once gentle and spirited.